Proper care of your cassette tapes will extend the tape life and increase your listening enjoyment. Always protect your tapes and cassette cases from direct sunlight, severely cold and dusty conditions. When not in use, cassettes should always be stored in the original protective cassette case. When the vehicle is very hot or cold, allow the interior temperature to become more comfortable before listening to your cassettes. o Never leave a cassette inserted in the player when not being played. This could damage the tape player unit and the cassette tape. o We strongly recommend against the use of tapes longer than C-60 (60 minutes total). Tapes such as C-120 or C-180 are very thin and do not perform as well in the automotive environment. 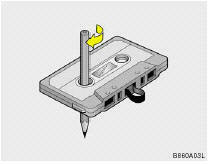 o Be sure that the cassette label is not loose or peeling off or tape ejection may be difficult. o Never touch or soil the actual audio tape surfaces. o Keep all magnetized objects, such as electric motors, speakers or transformers away from your cassette tapes and tape player unit. o Store cassettes in a cool, dry place with the open side facing down to prevent dust from settling in the cassette body. o Avoid repeated fast reverse usage to replay one given tune or tape section. This can cause poor tape winding to occur, and eventually cause excessive internal drag and poor audio quality in the cassette. If this occurs, it can sometimes be corrected by fast winding the tape from end to end several times. If this does not correct the problem, do not continue to use the tape in your vehicle. o The playback head, capstan and pinch rollers will develop a coating of tape residue that can result in deterioration of sound quality, such as a wavering sound. They should be cleaned monthly using a commercially available head cleaning tape or special solution available from audio specialty shops. Follow the supplier's directions carefully and never oil any part of the tape player unit. o Always be sure that the tape is tightly wound on its reel before inserting in the player. Rotate a pencil in the drive sprockets to wind up any slack. NOTE: Look at a tape before you insert it. If the tape is loose, tighten it by turning one of the hubs with a pencil or your finger. If the label is peeling off, do not put it in the drive mechanism. Do not leave tapes sitting where they are exposed to hot, warm, or high humidity, such as on top of the dashboard or in the player. If a tape is excessively hot or cold, let it reach a moderate temperature before putting it in the player.